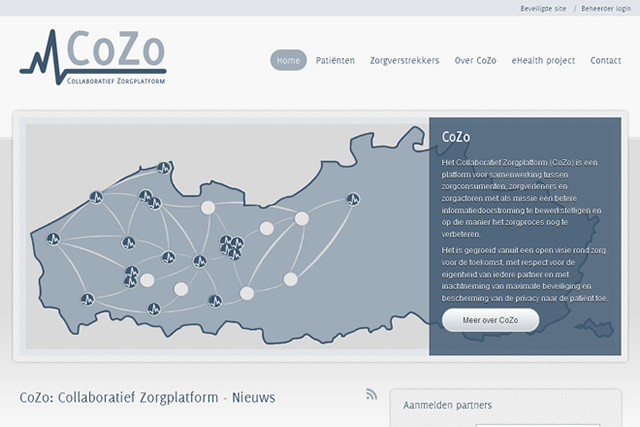 The “Collaboratief Zorgplatform” (CoZo) is a digital collaboration platform for patients, caregivers and healthcare facilities, that allows to exchange and share medical data and information in a fast and secure way. When CoZo grew from a collaboration between 4 hospitals in Ghent into a network of over 20 hospitals across Flanders, there was the need for the project’s own identity and website. My assignment was to design a simple, yet recognisable logo with accompanying styling and structure all information that needed to be publicly available. The last step was to develop a website that had to run on a Microsoft .NET platform (CMS). Note: Project as a full-time employee of UZ Gent. The project was recently redeveloped by a third party, but the original logo, general branding and graphic design were kept.